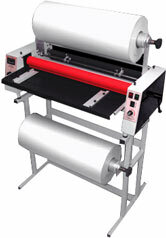 Heavy duty roll laminators in a variety of widths. The PL-1200HP 12” wide roll laminating machine is possibly the fastest 110v 12” roll laminator on the market. While producing a superb finish and edge seal it is capable of laminating at speeds up to 17 feet per minute and can laminate 3 mil thick laminating film in excess of 10 feet per minute. Extra wide, easy to use roll laminator. 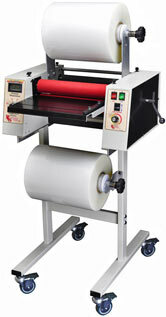 A high quality laminating machine for use with the economy films (1.5 mil and 3 mil). 27" heated roller laminator great for tough to laminate documents. 25 inch width. A commercial evolution on medium-duty laminator, designed for commercial applications setting a benchmark for quality, durability and reliability. 2 year factory warranty. The Ledco Professor 27 inch Roll Laminator can laminate items up to 27 inches wide. It has the capability of laminating items with thin 1.5 mil laminating film up to 10mil laminating film. This easy to use cold laminate machine applies cold laminate and/or adhesive. It also makes magnets and signs. Excellent for schools, offices, design studios - anywhere that safety and simplicity are an advantage. Cold film laminators are also easier to learn to use. The Xyron 1255 Pro offers three solutions in one easy-to-use package, the Xyron Pro 1255 makes applying adhesive to mock ups, storyboards, or comps up to 11.75” wide fast and easy. 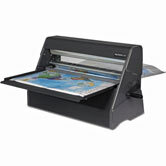 The Xyron XM 2500 Roll Laminator and Adhesive applier is great for posters, displays, mock ups, banners and signs. The Xyron XM 2500 uniques system instantly applies laminate without heat or electricity. Extra wide commercial grade roll laminator for use with films up to 10 mil thickness.